See, it looks like a colorful caterpillar right? Hahahaha it's nothing like a lollipop, GOD I HAVE FAIL, FORGIVE MEEEE hahhaha. Anyway i still manage to do the tutorial! Mwahaha. 1. Brush the eyebrow and apply NYX Milk Jumbo Pencil (optional if you have thick and dark eyebrow like me). 2. Outline the outer up to the middle eyebrow with red color. 3. Fill in the outer part up to the arch of your eyebrow with red and fill the arch of your eyebrow part with orange, then blend them. 4. Next add yellow and green, then also blend them no there'll be no harsh line between all the colors. 5. Last on your inner eyebrow use blue and blend with the green. 6. Put on the concealer and blend evenly to your skin. 7. 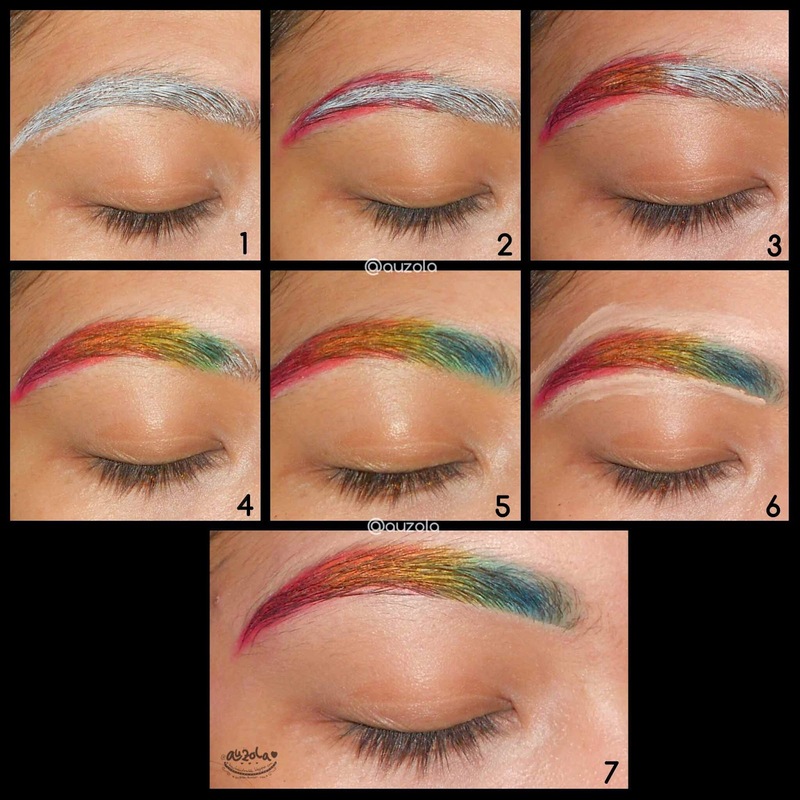 Tadaaa, rainbow eyebrow is done! 1. Draw half circle on your crease. 2. Draw smaller half circle inside the circle you just made. 3. Draw a winged eyeliner like but dont fill in the gap. 4. 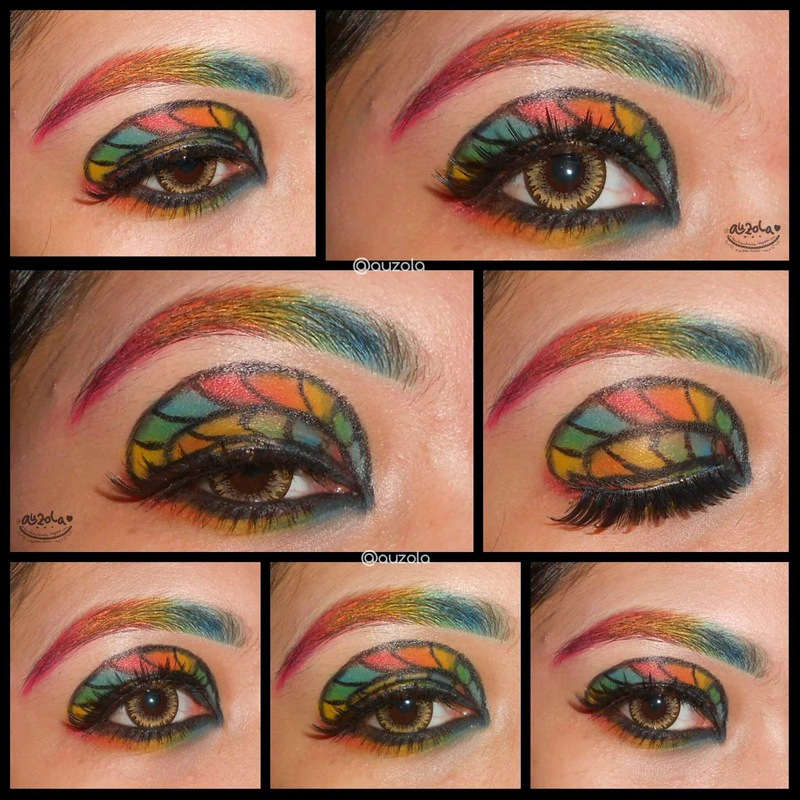 Fill the gap of your winged with eyeshadow (outer to inner: red, orange, yellow, green, blue). 5. 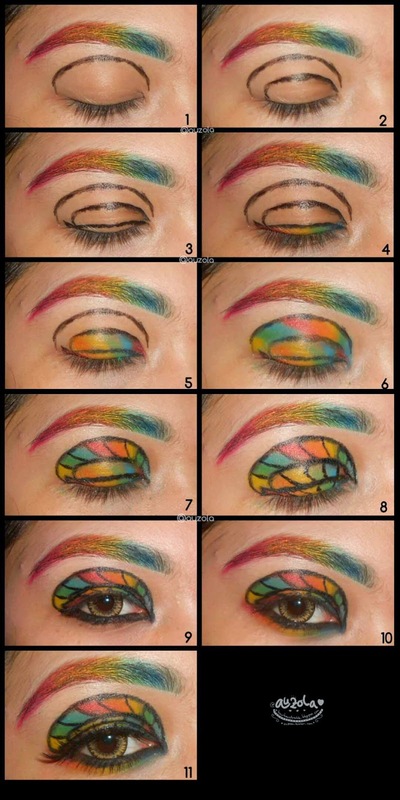 Fill the medium half circle with eyeshadow as well, but start out with a different color order (outer to inner: orange, yellow, green, blue, red). 6. 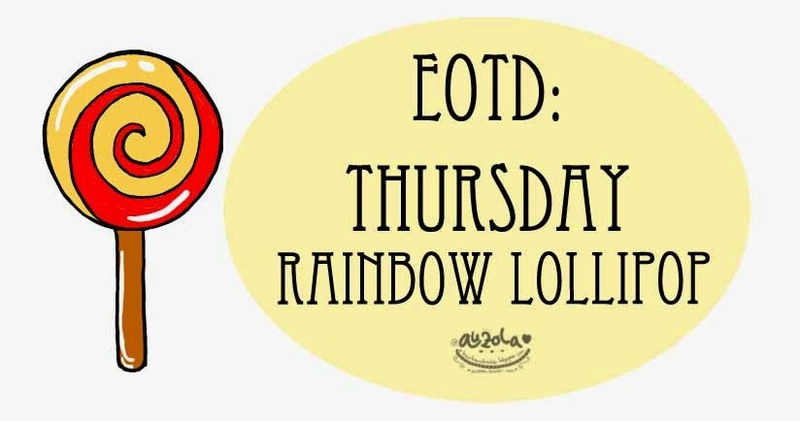 Fill in the next half circle also with a different color order (outer to inner: yellow, green, blue, red, orange, and continue the order if you still have some gap left). 7. Separate the colors in the upper half circle with black eyeliner. 8. Also do that on the middle half circle and the winged. 9. Draw black eyeliner on your lower lash. 10. 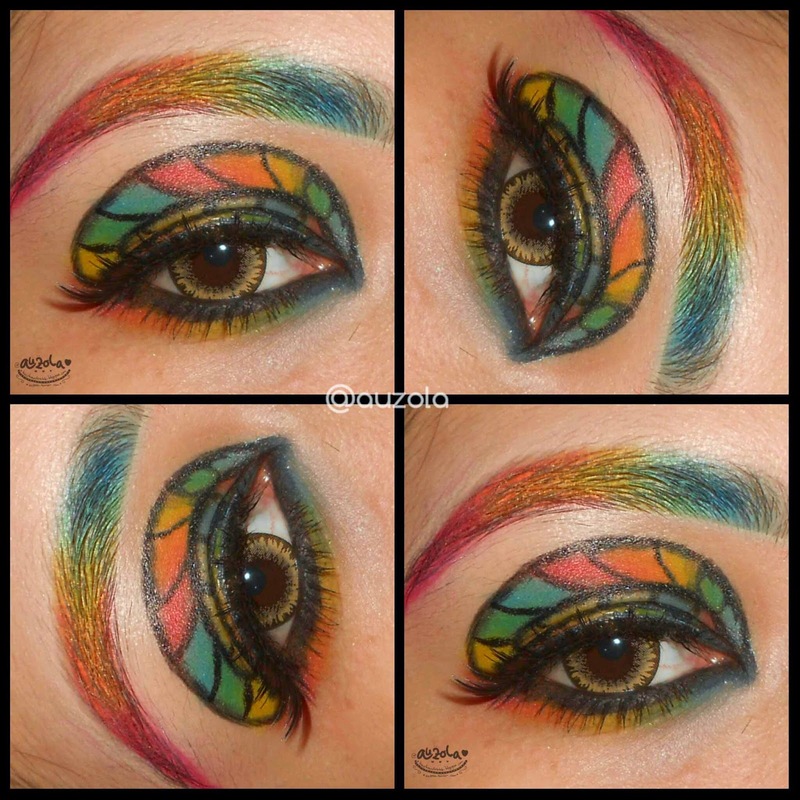 Add the colors below the eyeliner of your lower lash (outer to inner: red, orange, yellow, green and blue, blend them well). 11. Put on your mascara and falsies of your choice. And you're done with the colorful caterpillars hahhaa.